Once you have chosen the correct style of pattern for your body type, it’s time to consider the fashion fabric, lining, interfacing, etc. 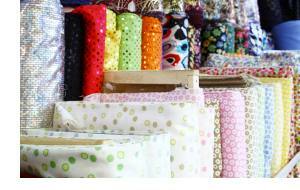 Natural fibers such as medium weight cotton, linen and light-weight wool are excellent choices for the novice sew-er. They are generally easier to cut, shape and press than synthetic fabrics. Many manufactured fibers exhibit a “springy” quality that can be frustrating for first-time sew-ers. Suggestions for suitable fabrics will be written on the back of the pattern envelope along with yardage amounts for each size and view. Napped fabric such as velvet and velour as well as one-way designs will often require additional yardage since the pattern pieces must all be cut in the same direction. A darker, rich color is achieved when the nap feels smooth as you run your hand from the bottom to the top of the garment. However, running the nap in the opposite direction may also be attractive especially in lighter colors. Depending upon the garment design, either wovens or knits will be listed. Often “not suitable for diagonals” will appear indicating that neither diagonal prints nor weaves will match successfully or work well with the pattern design. Read both the pattern descriptions and fabric suggestions carefully. If two or more garments are included, fabrics may vary. Patterns that require knits will have a self-explanatory guide on the envelope to help determine the amount of stretch that will be needed for that particular garment. Woven fabrics generally can’t be interchanged with knits; however, knits can often be substituted for wovens with some minor modifications. In some instances, cutting a woven on the true bias can mimic a knit since the bias has more stretch. This can produce lovely effects on such things as a thin camisole or a plain A-line skirt whose bias cut will drape nicely over the hips ending in a little flirty flare at the hemline. If lining yardage isn’t listed, purchase the same fashion fabric amount for skirts, pants or dresses. Jackets and coats usually require anywhere from a few inches to nearly a yard less depending upon the fabric width and pattern design. Suggested or not, lining a garment can add that “couture” touch. Wrap the fashion fabric around the body to get a sense of how it will drape then wrap it again over some lining. Acting as a buffer between the body and fashion fabric, lining helps camouflage little bumps and bulges while taking the brunt of the wear. Use a compatible lining or interlining with the fashion fabric. Very thin knits, tricots or even bathing suit fabrics are excellent to use with knit fashion fabrics but, if none are available, a good quality woven cut on the true bias can sometimes be substituted. Interfacings are available in woven, non-woven, fusible and non-fusible as well as varied weights and colors. If warranted, yardage and the type of interfacing to be used will also be listed on the envelope along with other notions such as buttons, fasteners, zippers, elastics and trims. While these are excellent guide lines, you will develop a sense for other choices and changes as your sewing skills progress. Of course, it’s recommended that you alter any patterns to your specifications and sew a “test” garment before cutting into the “good” fabrics. Instead of using muslin or something similar to test the fit, consider purchasing some inexpensive yardage comparable to your fashion fabric. The sample garment will give a much better perspective of how the finished product will fit and drape and could even become an unexpected “bonus” outfit.